Folks say I'm brilliant for coming up with this, but really I'm just observant: The old Marketing Funnel (AKA Product Funnel) doesn't work that well for most coaches unless they flip it over. The Marketing Funnel sounds so logical that I tried it out as soon as I heard of it, several years ago. Result? Hardly anybody bought my lower priced products, but because I focused on products instead of one-to-one coaching, I got FEWER clients! 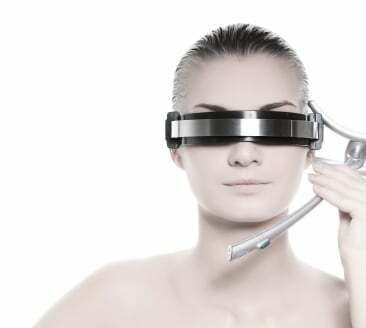 Not only that, but the lower-priced products were a lot of work to create and I needed to invest in a virtual assistant and a shopping cart, which weren't cheap. Most real coaches that I know have the same experience. I say 'real' because some folks do quite well with this business model, such as successful internet marketers, authors and speakers, who can afford to hire teams of consultants and assistants. They can make this work. Sometimes those people also call themselves coaches. If you're primarily a coach, without a team or a big budget and especially if you're new to sales and marketing, it's actually much easier to go straight to high-paying coaching clients and skip all the work it takes to fill your funnel. 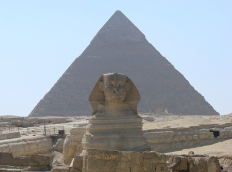 Because the funnel approach takes so much time, work and money to create, it felt kind of like building the Great Pyramids. Instead of a funnel, which sounds like it will just pull clients to you via gravity or suction or whatever, it's more like pushing bolders up a steep incline for slave wages. So I flipped the funnel over and turned it into the Great Coaching Pyramid. It's so much more effective for real coaches like me. 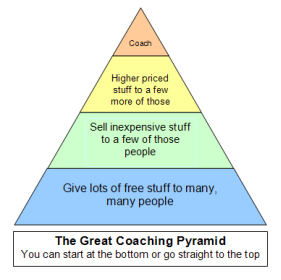 If you're a real coach and what you want to do is coach, then go straight to the top of the Great Coaching Pyramid and you'll experience success faster. If you love to coach, fill your coaching practice with one-to-one clients first, add products later, if you want. This way, you're doing what you love and that's really attractive. You don't need a huge investment or team to make it happen. Each client pays you well, so you make a living with 10-20 clients instead of 10,000 to 20,000. I kept my shopping cart and assistant and some products. Because I found that my one-to-one coaching clients were interested in buying my other products and services, as well. 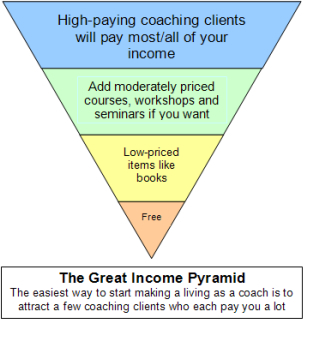 If you're a real coach, most of your income should come from coaching, right? And you can make a much better income by focusing on coaching, itself. People will hire you without sampling all your products. Why? Because you're a good coach. You get that way by doing a lot of coaching, not by creating websites and products. 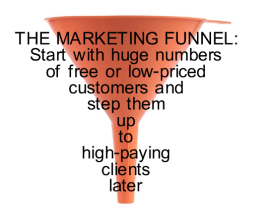 Here's a secret: Marketing Funnels are NOT triangular. A great company that teaches about marketing funnels and is honest and upfront about it is Hubspot. They have a team of very smart professional marketers. They're much better at it than you and I. I've seen screen shots of Hubspot's marketing funnel, based on their marketing data. It necks down to almost nothing after the very first level. 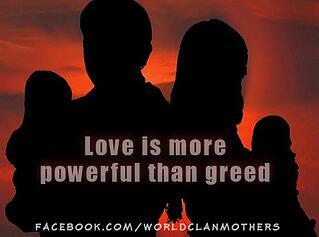 That means they need to reach tens of thousands of people just to get a few clients. Here are a few numbers about that: Fantastic marketers are happy to convert 5-10% at each level of their funnel. Not so great marketers are lucky to convert 1-2%. At a 2% conversion rate, you'd have to attract 2.5 Million free customers to get 20 high-paying coaching clients. Or you can build your business with coaching. There are a few more spots in the Coach 100 Mentor Group. Join and fill your practice with coaching clients by July.